The capsule of the KMS 104 vocal microphone, exclusively for use with the Sennheiser SKM 2000/9000 handheld transmitter. The capsule head provides the best possible suppression of sound originating from 180° to the rear. Thanks to the combination of the KK 204 and KK 205 capsule heads with the wireless Sennheiser 2000/9000 series, Neumann sound is also available in the wireless domain. This opens up new sound dimensions for the most demanding live-performance engineering. Here the key areas of expertise of Neumann and Sennheiser are united in an unprecedented manner to create products with no compromises for professional use. Neumann capsules have already been used in combination with the Sennheiser SKM 5200 handheld transmitter for the past 10 years on some of the largest stages of the world and at mega-events such as the Eurovision Song Contest, where the highest demands are placed on the sound and transmission reliability. These systems reveal their strengths particularly in conjunction with Sennheiser in-ear monitoring. 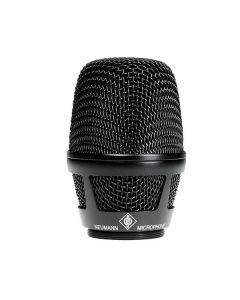 The design of Neumann capsule heads for the Sennheiser SKM 2000 handheld transmitter is based on the extremely successful, multiple award-winning wired stage microphones KMS 104 and KMS 105. From these microphones the capsule heads have acquired not only their outstanding sound characteristics and technical specifications, but also their robust construction and effective suppression of pop sounds and handling noise. The sound of the capsule heads can be described as full, transparent and naturally warm, without excessive accentuation of the bass. Due to the „single polar pattern design“, the polar patterns are very uniform over the entire frequency range, thus providing the basis for excellent resistance to feedback. The capsules, and also of course the transmitter unit, are available in both nickel and black. Included with the capsule heads is a large nylon bag, which can hold not only the capsule but also the handheld transmitter, battery packs and additional accessories. The KK 204 and KK 205 capsule heads were developed especially for the wireless Sennheiser 2000/9000 series. Particular importance has been placed on further damping of pop sounds and handling noise, an extremely low level of self-noise, and ease of servicing. Both capsule heads have integrated foam pop protection. The foam pores have a greatly increased surface area and can keep extreme moisture away from the capsule.